I’ve been baking since I was around two years old. My mom went to nursing school and I stayed with my grandma. We loved to bake cookies together and made a lot of them. Peanut butter was our must commonly baked cookies but chocolate chip and sugar cookies made appearances as well. I still love baking, especially around the holidays. I find it relaxing and baked goods always make people’s days better. When I was in high school I liked to make cookies around finals to take up to the local college ministry for the students. I made a lot of friends up there, I even married one of them! I can’t say for sure these things are related but my husband does enjoy a good homemade cookie. I love to make up a bunch of sugar cookie dough during the holidays to have on hand. It’s such a versatile dough. You can make them plain, with icing, with sprinkles, or one of my favorite ways, with a hidden fudge mint cookie inside! 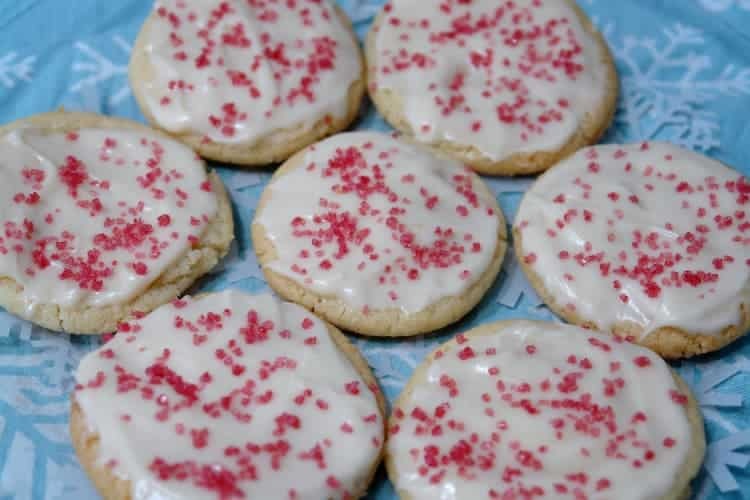 You can even make gluten-free sugar cookies. 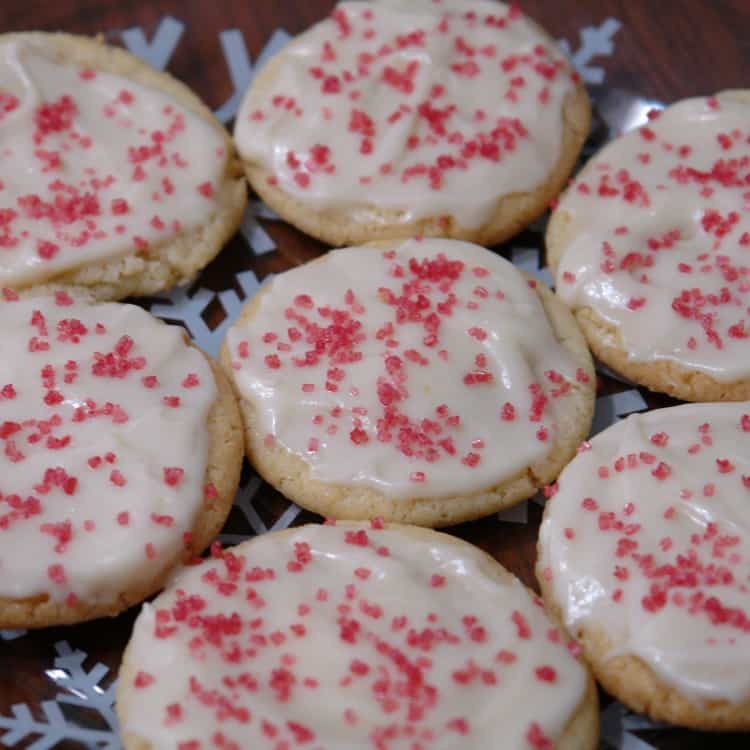 Another favorite way to use sugar cookies around my house is with cream cheese frosting. Let’s be honest, the sugar cookie is good but it’s mostly a way to eat the cream cheese frosting which is delicious. These cookies are simple drop cookies so they don’t take much time at all. I love to take them to holiday parties and there are hardly ever any leftovers. I’ve had multiple people tell me they don’t normally like sugar cookies but they like these. First be sure to soften your butter. Melted butter doesn’t work well in cookies so you want to make sure to leave it at room temperature long enough to become soft. It’s best if the butter is still cool to the touch but when pressed using a bit of pressure it will leave an imprint. Once your butter is ready, be sure to preheat your oven. Then mix up your sugar cookie dough. If you are doing drop cookies you can use the dough right away, if you want to shape the cookies be sure to leave the dough in the fridge for 1-2 hours to chill. Roll your dough into balls and place on your cookie sheet. Or you can roll out your dough and make cute shapes. I occasionally make shaped cookies but most of the time I just make drop cookies, add some sprinkles and they are festive without the work of cutting them out. Bake your cookies, being sure not to over bake them. Sugar cookies are best when still soft. They should just be lightly golden when you pull them out of the oven. While your sugar cookies cool after baking, you will want to make your frosting. The cream cheese frosting is very easy to make. Simply mix the ingredients in a stand mixer or with an electric mixer until smooth. Feel free to add some food coloring to the cream cheese frosting or use it as is. Once you are sure the cookies are completely cool you can frost them. Be generous, this cream cheese frosting is delicious! For a fun holiday touch, you can sprinkle with crushed candy canes or Christmas sprinkles. In a small bowl mix together flour, baking powder, and baking soda, set aside. Roll into balls, if you want to shape the cookies, chill for 1-2 hours before rolling out dough. Place on cookie sheet, add sprinkles if desired. Bake for about 8-10 minutes or until just starting to get lightly golden. Don't overbake or the cookies will become crunchy. 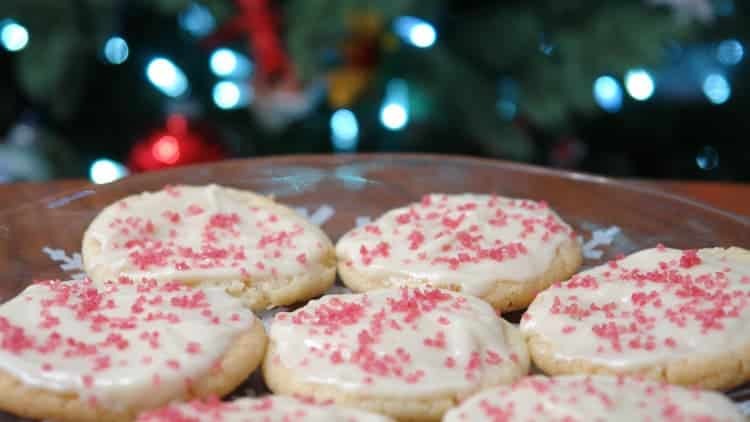 While the sugar cookies bake, mix all of the ingredients for the cream cheese frosting in a stand mixer or with an electric mixer until smooth. 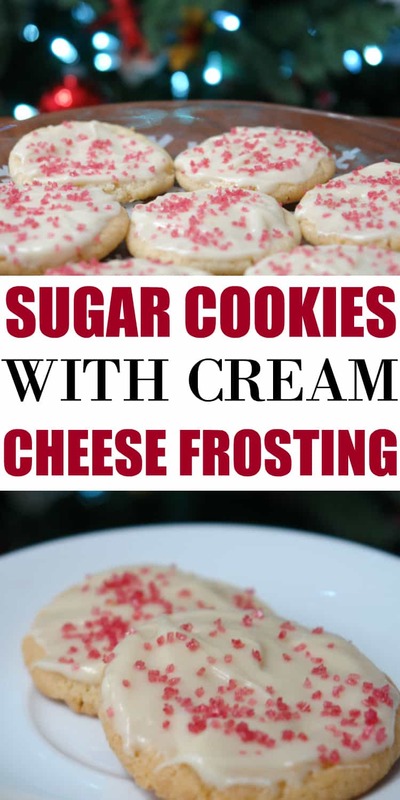 After the sugar cookies cool completely, frost with the cream cheese frosting and enjoy! 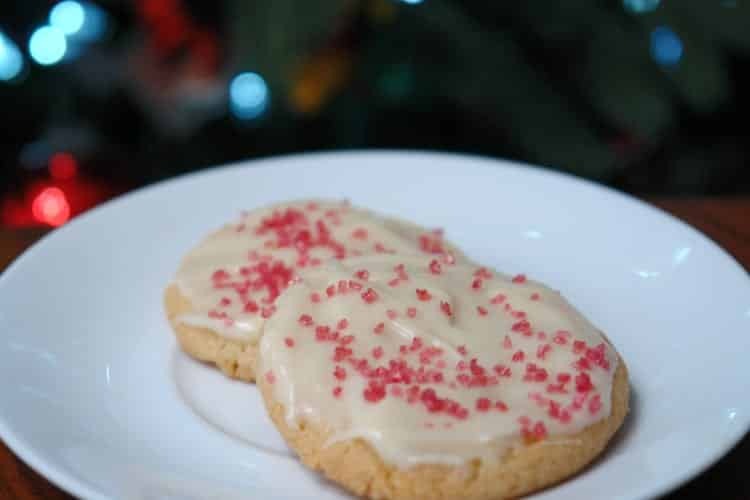 Be sure to also check out my sugar cookies with strawberry cream cheese frosting and my other delicious recipes here on All She Cooks.